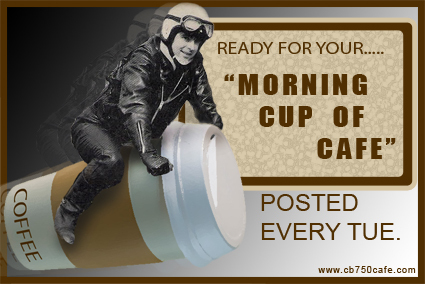 It’s Tuesday Cup O Cafe time and this time something to get your taste buds going. If you love the sound of the drags, how can you not like this that I am sharing today, I grew up watching Road racing and drags and this is such an awesome machine to watch British Top Fuel Drag Bike racer is a natural king of the track, check out just a sample of this 1500 HP monster and take a ride with him and you see just a little insight into my Countryman’s wild gulf drag Bike. This is so much harder than it looks and I am hoping that our Grease monkey ” Dakota Kai Sun” gets to be up with these guys at some point. Enough of me blabbing on, just hit the Volume, out ya feet up and enjoy the video’s. Anything that runs on nitromethane is exceptionally cool and that’s a fact which cannot be denied. The fuel is the most intense “power adder” in the known universe and whatever engine it is being put through sounds meaner than hell and is a literal bomb waiting to explode while running. 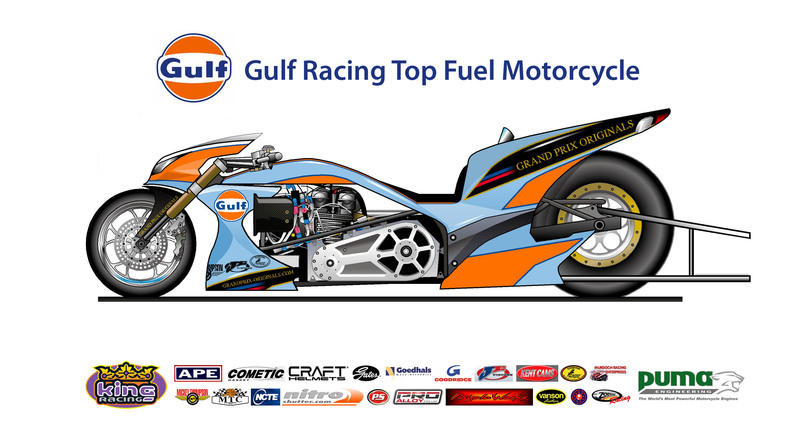 Top fuel motorcycles combine all the elements of over the top danger and speed and then the machines go the extra mile but putting the rider directly on top of a supercharged and nitro swilling engine. 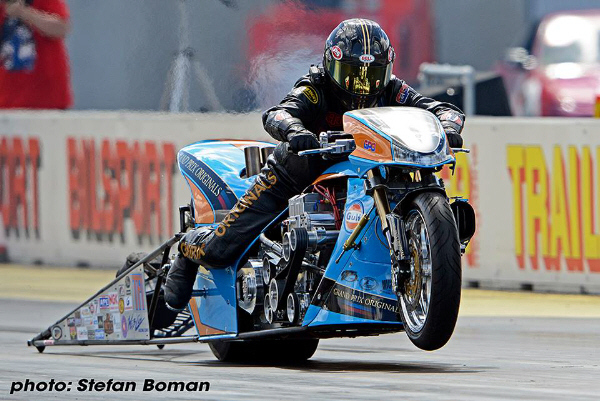 This video is a complete lap from fire up to shutdown on a top fuel motorcycle. NOTE: This is not a nitro harley. 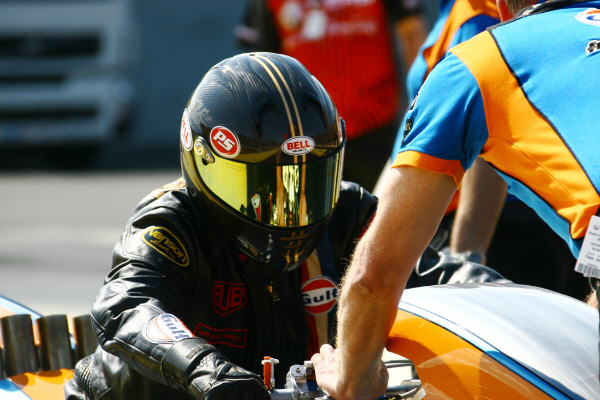 A top fuel bike is a very different animal. The rider whose head we’re glued to is Englishman Ian King who shipped his bike over for a recent event at South Georgia Motorsports Park. The run we’ll watch below was the final round where King needed to close the deal and make sure the rest of his hard work from the weekend was not wasted. As you watch the video, pay attention to what King is doing and also what he is not doing, mainly we’re talking about the fact that he’s heaving his body around on the bike to “steer it” as opposed to using the handle bars to actually direct the bike. Handle bars don’t help when the front tire is way off the ground. 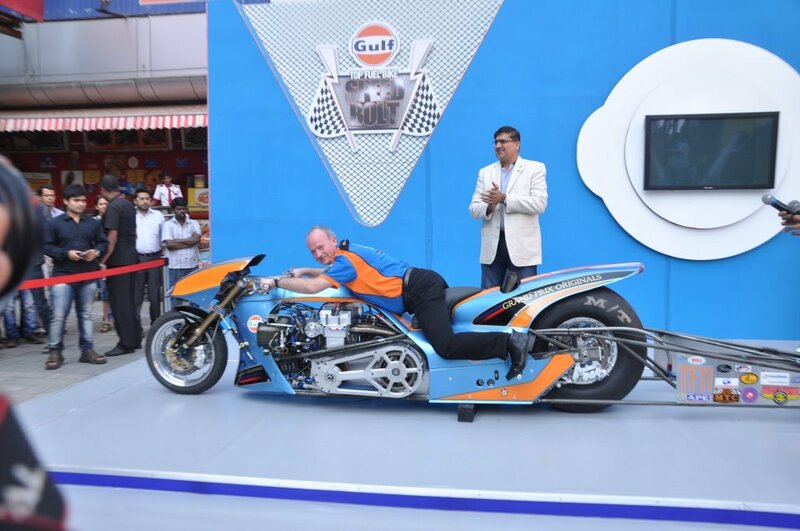 Take all of those elements we just mentioned and then add the fact that the bike is painted in classic Gulf colors? Yeah we know….too cool! 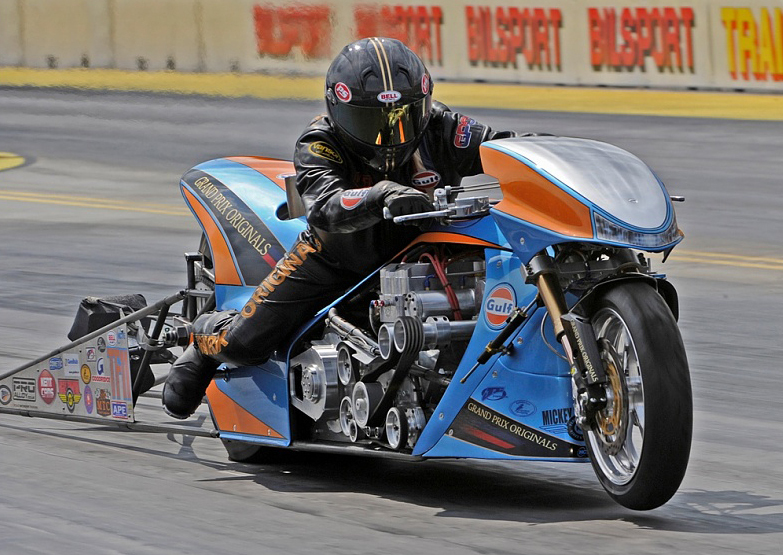 Read all bout the Brit and his amazing 1500 HP Drag bike here. 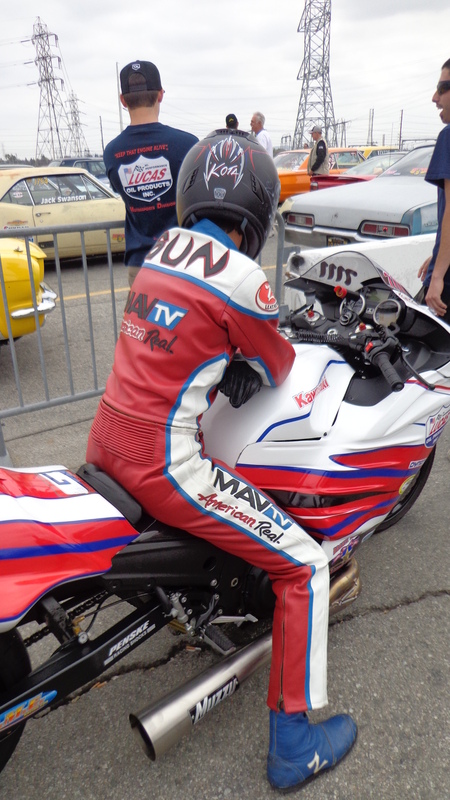 This entry was posted in Blog and tagged 1/4 mile, dag racing, drag bike, ian king, Lucas Oil, motorcycle, nhra. Saw Blades, we all use them, check this out!